New Year, New Cat, and a Giveaway! Happy New Year, everyone! Don’t worry, the cat isn’t part of the giveaway. She’s too adorable. Meet Tora, the newest member of our household (Tora is Japanese for “tiger”). 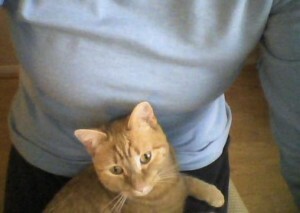 When she’s not stalking squirrels and birds through the windowpane, she’s settled in my lap as I write. Sort of a furry critique-partner. This is our first time as cat owners (or does the cat own us? We seem to serve as her wait staff). My job as cozy mystery writer seems more official now, don’t you think? *wink* After all, mystery writers such as Raymond Chandler, Stephen King, Patricia Highsmith, Edgar Allan Poe, and Martha Grimes have had kitties. Cats and mystery-writing seem to go together, as evidenced by the successful cat mystery series of Lillian Jackson Braun, Rita Mae Brown and Carole Nelson Douglas. 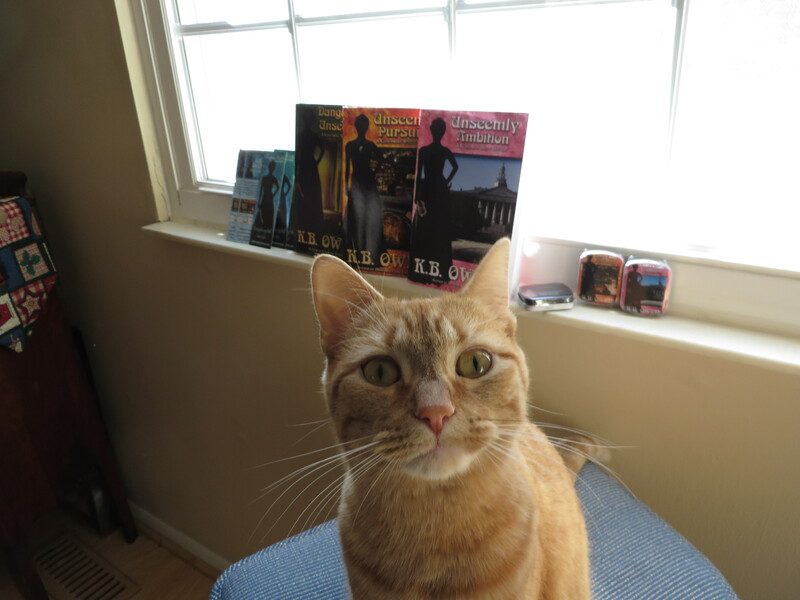 Even before Tora came along, I had written a cat into book 2 of my Concordia Wells Mysteries, Unseemly Pursuits. Surprisingly, Concordia herself is not a big fan of cats, though the creatures take particular delight in jumping into her lap and kneading her skirts. The lady professor may have to put up with more cats in the future. To celebrate the release of the latest Concordia Wells Mystery, Unseemly Ambition, I’ve been holding a giveaway, which started October 14th and ends January 31st. There’s still time to get your name in! I’ll be announcing the winners on February 6th. Signed copies of all three books in the series so far: Dangerous and Unseemly (book 1), Unseemly Pursuits (book 2), and Unseemly Ambition (book 3). *Please note that for any of the winners living outside the United States or Canada, I may have to substitute a gift card to Amazon because of the prohibitive postage for certain items. It will depend on the prize. Tora is wearing her skeptical look…what, you haven’t entered the drawing yet? 4. leave a comment on any post written between October 14th and January 31st. Remember, your name can be entered more than once, so participating in multiple ways will increase your chances of winning, and it helps me out enormously! I am, as ever, so grateful for your support, and I love connecting with you all. Good luck, and thanks so much! Love the new kittie. Such a sweet face! Well now that you have a cat, I’m expecting really great things. Not that you haven’t already delivered great things, but with the addition of a cat, that changes the expectation level. And I can’t believe you didn’t include Jessica Fletcher in that list of mystery writers. Oh wait, she wasn’t a writer, she was a sleuth. Whatever. Here’s to a productive 2015, Kathy!! Oh, boy…looks like I’ve upped the ante! Now I have to live up to the cat. Such is life. Nice to see you, Patricia! I just subscribed. I love cat mysteries! Welcome, Carolsue! So nice to see you. What’s your fave series?